Since 1910, The University of Texas has furnished facilities, administrative oversight, utilities, and business and personnel services to the University Interscholastic League. The following timeline chronicles the steps taken to adequately house the UIL while maintaining the vital relationship between The University of Texas at Austin and the public schools of Texas. July 1988 - The UIL developed an estimated space needs projection. October 1989 - The UIL Legislative Council created a facilities committee to investigate the facility needs of the UIL and make a recommendation to the full council. January 1990 - The UIL finance committee recommended to the Legislative Council a building fund be created with carry-over funds in excess of $2,000,000 each year. September 1990 - The Interscholastic League Advisory Council created by the 71st Legislature in SB 417 recommend to the UIL Facilities Committee that public schools, UT Austin, and other interested organizations band together to develop a solution to take care of the present facility needs of the UIL and allow for future growth. June 1993 - University of Texas Systems Board of Regents authorized a project for the University Interscholastic League building. April 1994 - The University of Texas System Board of Regents approved preliminary plans for the UIL building. October 1994 - UT and the UIL mutually agreed to halt plans for this building since it could not be constructed within the approved budget. November 1995 - Preliminary floor plan design and elevation approved by Board of Regents. December 1996 - Bid Opening. February 1997 - Ground Breaking. 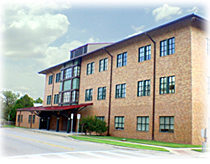 June 1998 - UIL opens new building at 1701 Manor Road.